Sinn Féin Councillor Pol Gribin is delighted that Roads Service cleared the ivy causing a danger to pedestrians on the Bann Road. 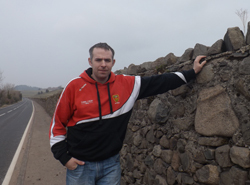 Sinn Féin Councillor Pól OGribin has welcomed the removal of ivy and other cosmetic improvements to the Bann Road made by Roads Service. “Ivy attached to the wall that runs adjacent to the footpath was making it difficult for walkers who were having to step on to the road in order to avoid it. This was therefore a safety issue. “I made representations to the Roads Service regarding this and I would like to thank them for their quick action in getting the Ivy removed,” he added.